Danish Army Specific: A single 1625 has found is way into the Danish Army. It was transferred from the Navy around 1997. It is used by a CBRN-squad a the isle of Bornholm. 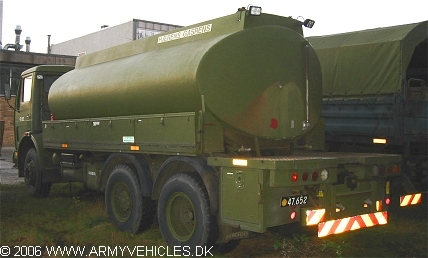 The tank can contain 10.000 litres of liquids. 2 high pressure cleaners were previously mounted at the rear of the vehicle. Length: 7.84 m (305 inches). Width: 2.48 m (97 inches). Height: 3.15 m (123 inches). Weight: 22.000 kg (48.400 lb.). Engine: Own V8-cylinder, type OM402, 12.760 cm3 (778 cubic inches), liquid cooled. Horsepower: 256 at 2.500 rpm. Transfer case: 2-speed, type GV-90.